Eastern Chad, Hadjer Hadid. 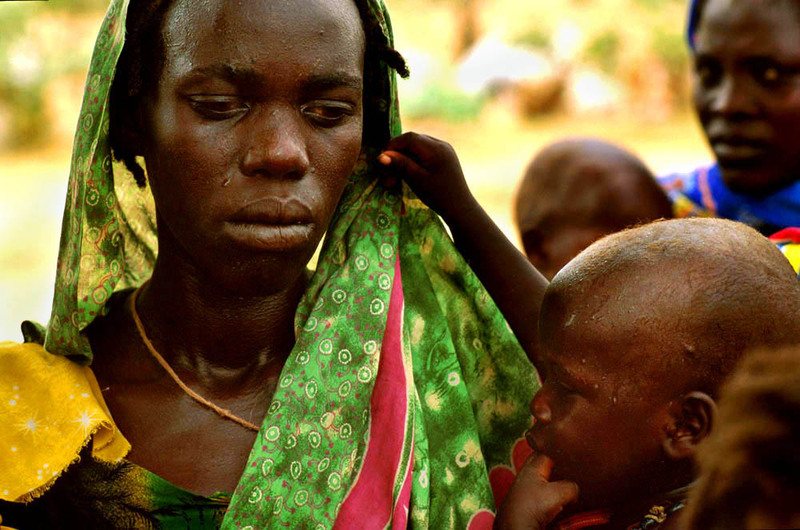 A mother with her malnourished child, at the Bredjin Refugee Camp, on the border with Sudan. Hadjer Hadid. The heat, of the day, in the Bredjin refugee camp, situated in the South of the Sahara Desert, evident, by the sweat on this woman, and her child, while, waiting for water. Hadjer Hadid. The Bredjin refugee camp, close to the border with Sudan. The makeshift shelter's, are of the so-called "spontanie's", or spontaneous arrivals, who are given plastic sheeting to make shelters, as they arrive, to be housed in tents later. Hadjer Hadid. A mother and child in the Medecins Sans Frontieres, Therapeutic Feeding Centre(TFC), in the Bredjin Refugee Camp. In the TFC the most malnourished are fed and medicated back to health. Adre. A child refugee looks through a plastic fence at the the Medecins Sans Frontieres Health Centre at the Farchana refugee camp, close to the border with Sudan. Adre. A woman, mixes sorghum, maize, suger, salt, and oil, into a mixture, which is given to refugees, at the Supplementary Feeding Centre(SFC) in Farchana refugee camp, close to the border with Sudan. . The SFC is set up and run by Medicins Sans Frontiers, for children suffering from malnutrition. Adre. 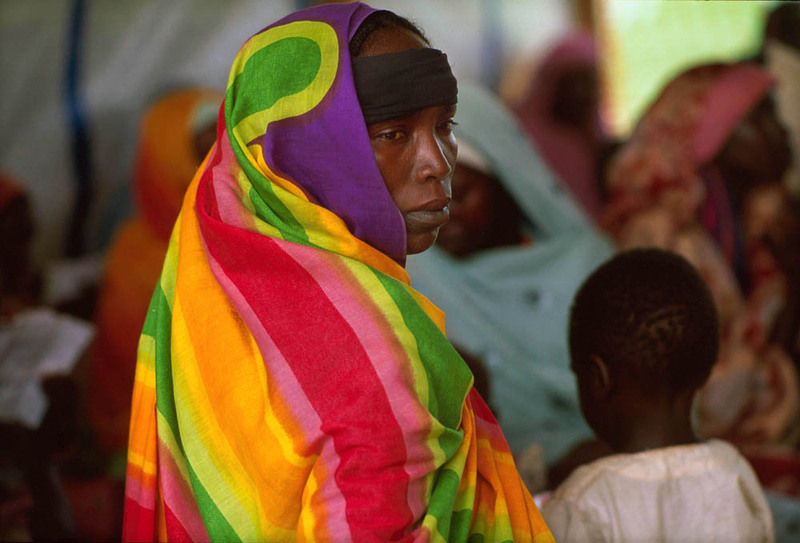 A woman, in the Farchana refugee camp, close to the border with Sudan, walks past tents donated by the United Nations High Commission for Refugees. Hadjer Hadid. A mother and child in the Medecins Sans Frontieres, Therapeutic Feeding Centre(TFC), in the Bredjin refugee camp, close to the border with Sudan. In the TFC the most malnourished are fed and medicated back to health. Adre. Refugees in Farchana camp. There are about 14000 refugees from neighbouring Sudan, living in this camp, close to the border. Hadjer Hadid. Women, queueing for water, in the Bredjin refugee camp. Adre. 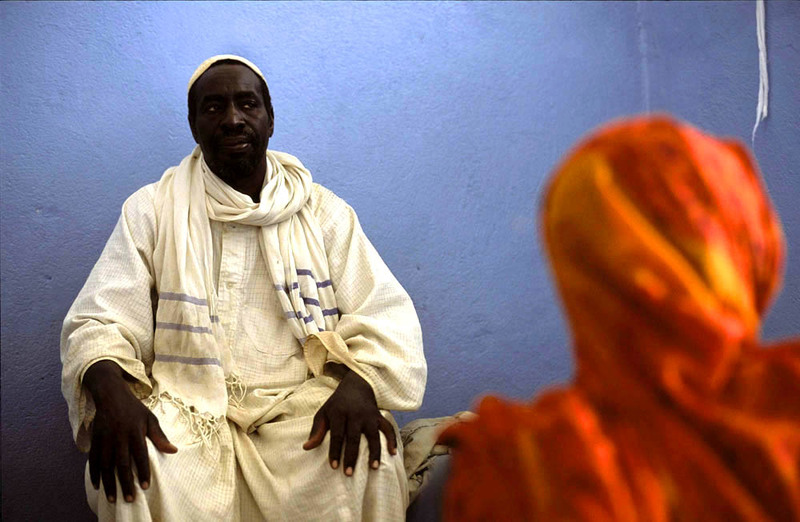 A man, and his wife, wait for their little girl to be treated for malaria, at the Medecins Sans Frontieres health Centre at Farchana refugee camp, close to the border with Sudan. There are about 14000 refugees from neighbouring Sudan, where a devastating conflict continues, in this camp. Hadjer Hadid. A child in the Medecins Sans Frontieres, Therapeutic Feeding Centre(TFC), in the Bredjin refugee camp, close to the border with Sudan. In the TFC the most malnourished are fed and medicated back to health. Hadjer Hadid. The Bredjin refugee camp. There are about 46000 refugees from neighbouring Sudan, where a devastating conflict continues, in this camp. Hadjer Hadid. Refugees, mostly woman, collecting water, in the Bredjin refugee camp, close to the border with Sudan. There are about 46000 refugees from neighbouring Sudan, where a devastating conflict continues, in this camp.